The Oscars ceremony does nothing for me, so I tend to avoid all Oscar-related media coverage. I’m a sucker for a topical quote, so I decided to check out the post. Up to that point I had never heard of J K Simmons, winner of Best Supporting Actor for her part in Whiplash (call me out of touch, but I’ve never heard of Whiplash either). 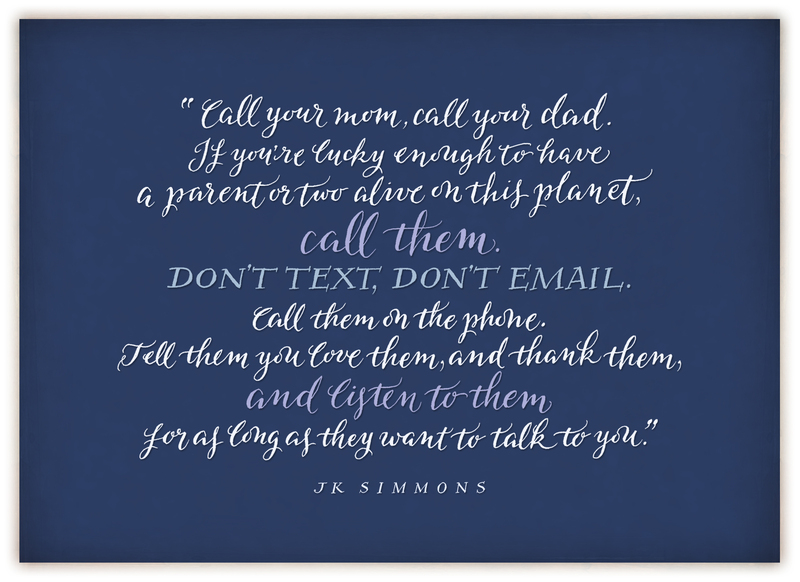 As I’ve mentioned in previous posts, whenever I read words that affect me I’m compelled to fetch my pens and write… and so I lettered an abridged version of Simmons’ quote which I’ve featured at the top of this post (or see it here on Flickr). I’m not sure where this compulsion to write particular words comes from… maybe, by writing them, I feel that I’m endorsing the sentiments, sealing them with my own stamp of approval. Or maybe I’m just passionate about putting pen to paper. But enough about me. Instead, pay heed to Simmons. As soon as you finish reading this post, get on the phone and “call your mom, call your dad,” while you still can. I just realised that in my previous post I was advising everyone to write for the sake of their children. Now I’m advising everyone to call their parents. Despite how it looks, I have no intention of pursuing a career in counselling. I’m a calligrapher. Through and through. And you can quote me on that!